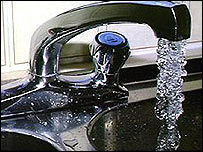 Ministers are planning to allow fluoride to be added to all drinking water in England and Wales it is being reported. The move is being considered to help reduce tooth decay among children in "deprived" areas, according to The Sunday Times. Such a measure would prove controversial as critics fear fluoride could be linked to increased risks of cancer, hip fractures, kidney trouble and birth defects. But the government has previously insisted there is no evidence to support claims of health risks from adding chemicals to drinking water. Only about 11% of the population currently receive fluoridated water. Health authorities may get powers to increase fluoridation in drinking water rather than water companies under amendments to the Water Bill later this month, according to the paper. It says it has seen a letter from health minister Hazel Blears and environment minister Elliot Morley dated in April to Deputy Prime Minister John Prescott, in his role as chairman of the domestic affairs Cabinet committee. The letter read: "Those who remain adamantly opposed would be able to use water filters that remove fluoride or buy bottled drinking water." It went on: "Experience of oral health promotion projects shows that it is much harder to establish regular tooth-brushing in deprived areas, because of the costs of toothpaste and, perhaps, because of the less ordered lifestyles lived by families." It said the minority who opposed the move should not be allowed to stop fluoridation by continuing to insist on more research. Cabinet members may be allowed a free vote on the issue, according to the paper. The campaign director of the National Pure Water Association, Jane Jones, said: "There will undoubtedly be a huge row about the renewed proposal to add fluoride to the drinking water on a wide scale in the UK. "This is nanny statism. It is outrageous. "To medicate the whole population against their will is not the way to deal with tooth decay." The Green Party is also among those opposing such a move. Health spokesman Martyn Shrewsbury said: "The general trend in the world is against fluoridation. "It's quite incredible that Tony Blair would want to fluoridate Britain". He said this proposal would be against medical ethics as a patient must give consent to medication under the European Convention of Human Rights. Mr Shrewsbury also argued there was no proof that fluorinated water reduced the risk of tooth decay comparing fluoridated Gateshead with non-fluoridated Liverpool saying that they had the same level of tooth decay. A Department of Health spokeswoman said last September Ms Blears had stated a report on fluoridation by the Medical Research Council contained "nothing to suggest any reason why water fluoridation should not be considered as a public health measure in areas where dental health remains a serious problem". Ian Wylie, chief executive of the British Dental Association, said: "It's tragic that, in 2003, there are still children as young as five having most or even all of their teeth removed under general anaesthetic as the result of tooth decay. "Water fluoridation is a positive step in narrowing the health inequalities that currently exist. "Targeted water fluoridation is the one public health measure that would cause the largest improvement in the oral health of those in greatest need. "The BDA strongly supports any change that would allow the introduction of water fluoridation, after full consultation and with the agreement of the local community." "Dentists believe the benefits of fluoride in tap water are clear"